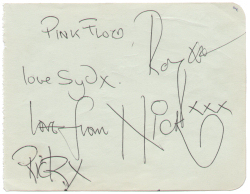 Pink Floyd Autographs Examples | Roger Waters, Syd Barrett, David Gilmour, Nick Mason and Richard Wright. Floyd was a psychedelic/progressive rock band formed in Cambridge, England, United Kingdom in 1965. 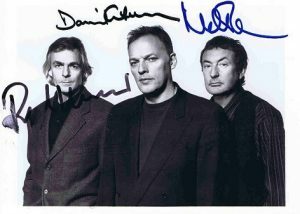 Pink Floyd is one of rock’s most successful and influential acts; having sold over 200 million albums worldwide and with 74.5 million certified units in the United States, making them one of the best-selling artists of all time. 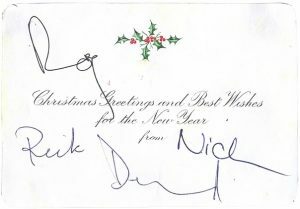 The band’s classic lineup was Roger Waters (vocals, bass), David Gilmour (vocals, guitar), Rick Wright (organ, keyboards, vocals) and Nick Mason (drums). Gilmour was brought into the band in 1968 to replace the band’s founder; singer, guitarist and songwriter Syd Barrett, who had become increasingly erratic and departed from the band a few months after Gilmour’s addition. The band became known for their advancements in the genres of psychedelic rock and progressive rock music, philosophical lyrics; avant-garde compositions, sonic experimentation, innovative cover art and elaborate live shows. Furthermore, they enjoyed modest success in the late-1960s as a psychedelic band led by Syd Barrett. 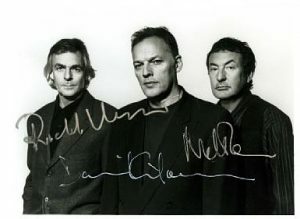 Barrett’s increasingly erratic behaviour eventually caused his colleagues to replace him after The Piper at the Gates of Dawn with guitarist David Gilmour. 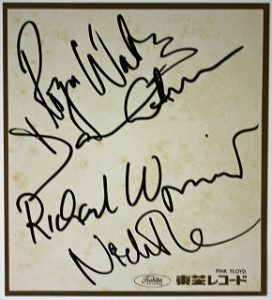 The band went on to record several elaborate concept albums; achieving worldwide success with 1973’s The Dark Side of the Moon (The second best-selling album of all time); 1975’s Wish You Were Here, 1977’s Animals, and 1979’s The Wall, among the best-selling, most critically acclaimed, and enduringly popular albums in rock music history. In 1985, singer and bassist Roger Waters declared Pink Floyd defunct. 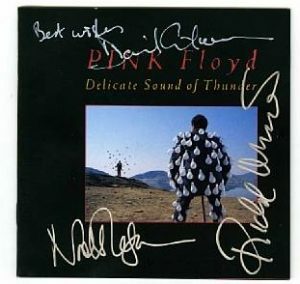 However, the remaining members continued recording and touring under the name, eventually reaching a settlement with Waters giving them rights to the name and most of the songs. Pink Floyd evolved from an earlier band, formed in 1964, which was at various times called Sigma 6; The Meggadeaths, The Screaming Abdabs, and The Abdabs. When this band split up, some members — guitarists Bob Klose and Roger Waters, drummer Nick Mason; and wind instrument player Rick Wright — formed a new band called Tea Set; also joined shortly thereafter by guitarist Syd Barrett, who became the band’s primary vocalist as well. 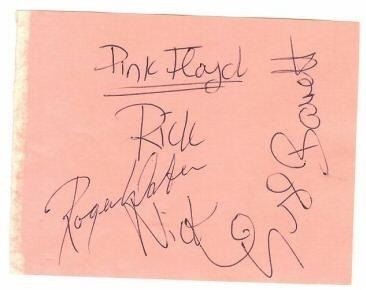 When Tea Set found themselves on the same bill as another band with the same name, Barrett came up with an alternative name on the spur of the moment; choosing The Pink Floyd Sound (after two blues musicians, Pink Anderson and Floyd Council). For a time after this, they oscillated between ‘Tea Set’ and ‘The Pink Floyd Sound’, with the latter name eventually winning out. The word Sound was dropped fairly quickly, but the definite article was still used occasionally for several years afterwards, up to about the time of the More soundtrack. In the early days, the band covered rhythm and blues staples such as “Louie, Louie”, but gained notoriety for psychedelic interpretations, with extended improvised sections and ‘spaced out’ solos. The release of Pink Floyd’s massively successful 1973 album; The Dark Side of the Moon, was a watershed moment in the band’s popularity. Also, Pink Floyd had stopped issuing singles after 1968’s “Point Me at the Sky” and was never a hit-single-driven group; but The Dark Side of the Moon featured a U.S. Top 20 single (“Money”). The album became the band’s first #1 on U.S. charts, a huge improvement over its previous recordings. Additionally, the critically-acclaimed album stayed on the Billboard Top 200 for an unprecedented 741 weeks (including 591 consecutive weeks from 1976 to 1988); establishing a world record and making it one of the top-selling albums of all time. It also remained 301 weeks on UK charts, despite never rising higher than #2 there; highly praised by critics. Saxophone forms an important part of the album’s sound, exposing the band’s jazz influences; and female backing vocals play a key role in helping to diversify the album’s texture. For example, straight rock songs such as “Money” and “Time” are placed on either side of mellow pedal steel guitar sounds (reminiscent of Meddle). 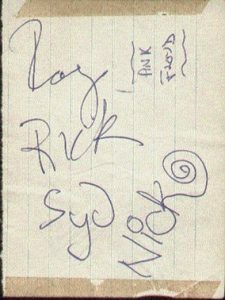 In “Breathe” and female vocal-laden song; “The Great Gig in the Sky” (with Clare Torry on lead vocal); while minimalist instrumental “On the Run” performed almost entirely on a single synthesizer. Incidental sound effects and snippets of interviews feature alongside the music, many of them taped in the studio. The album’s lyrics and sound attempt to describe the different pressures that everyday life places upon human beings.